In a world of modern keyboards, there’s something about Roland’s new C-230 Classic Keyboard that speaks of the past. That’s not to say that it doesn’t have cutting edge technology in it. 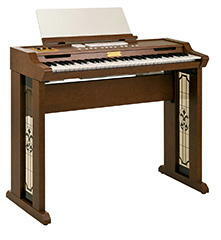 The C-230 features 36 classical organ tones, 8 organ bass tones, 4 harpsichord tones, two fortepianos, celesta, and a range of other sounds that can be added to the organ voices. Spanning five octaves, the tuning can be adjusted in five ways (Equal, Werckmeister, Kirnberger, Vallotti, Meantone), there’s a damper and expression pedal, and a built-in speaker system (10W x 4) comprising two full-range speakers, two tweeters and two satellites, for a much fuller, enveloping sound. The compact case is constructed from simulated mahogany, and it’s easily portable. Availability and pricing to be confirmed. When Rodgers/Roland merged in the late 1900s they enhanced an available Roland keyboard to create the C-100 Classic Digital Keyboard. In comparisons with other digital keyboards, the C-100 still stands out in live performance capacities and qualities. I designed a wheeled metal frame to haul my C-100 in my minivan to venues. The C-100 has put me in popular demand. The C-100’s memory power is directed to maximize performance and voice quality rather than on automatic features such as rhythm. Voices MIDI’d to pipe organs had to sound realistic, not electronic. Controls are simple. Direct selection of voices allows layering, mixing and blending. Accessibility and control of voices allows live performance capabilities far exceeding later models and competitors’ instruments. Sustain pedals allow layering voices to continue sounding while others are added, each sustained separately, as orchestra sections perform. When selecting a voice, a previously selected voice is not cut off. Touch sensitive keys. The attack and release is true to each instrument’s character. Sound cards add voices to the 64 that are native onboard the instrument. MIDI interface with other digital devices are available. The defining quality of the C-100 is the result of its features in live performance. Onboard speakers are acceptable except for low frequencies. With a powered subwoofer, the onboard speakers are sufficient to fill a medium theater-sized auditorium. When enhanced with amplified speaker systems for very large venues, the C-100s very natural voice qualities hold true, and can be controlled in live performance to suit to the event’s audience. With today’s memory size technology the C-100 could go even further. Voice selection by pressing the fragile buttons in contact with failure-prone microswitches is a weakness that could be solved by a touch screen, something like Virtual Theatre Organ does, which displays stop tabs. Let it record and playback artist improvisations. Interface it with a music-printing program on a laptop, such as e-Piano or Garage Band. I’d buy a superpowered C-100 like that, but I’d never give up my original Rodgers C-100 Classic Keyboard as long as I can keep it playing. I’ll soon need a new SN-U110-06 Sound Library PCM DATA ROM (Orchestral Winds) to replace my old one. It getsinserted into two other C-100s I perform on. It is showing signs of wear. When you stopped making the C-100 you shot yourself in the foot! At least help me keep mine alive with replacement parts. What a brilliant response in praise of the C-100! Thank you for taking the time to compose and submit it to the site. Unfortunately I personally have no affiliation with Roland, however perhaps this will find its way to someone in their marketing / customer care department. I have a C-100 and love it. However, I am only 14 years old, have no manual and I have 9 keys that just stopped working all of a sudden. I’m teaching myself how to play but, it’s difficult with no manual and 9 keys broken. Any ideas anyone?